Epson inkjet printers are installed in several computer labs to serve your photo-printing needs. For optimal results, we recommend you follow the color management procedures outlined below for color and black-and-white prints. Image size: Be sure your image's resolution is at least 240ppi (300ppi is preferable). You are encouraged to size and re-sample your image to fit the paper at this point. Color profile: Be sure your image is using the Adobe RGB (1998) color profile (it allows for a wider range of printable tones than the sRGB space). Monitor calibration: A correctly calibrated monitor will produce a more accurate preview of your printed image. Lab computers with labels are calibrated on a regular basis. Media type: Different types of paper will produce different results. For instance, matte paper will produce images with less contrast than glossy or luster paper. Lighting: The type of light (i.e. Tungsten or fluorescent) that reflects off your print will affect the appearance of colors. It is important to always check your print under a balanced full-spectrum color-proofing light, such as the one stationed in the PEL. Printer: select the Epson 3800 (or Epson 7900 for wide-format prints in the PEL). Color Handling: choose Photoshop Manages Colors. 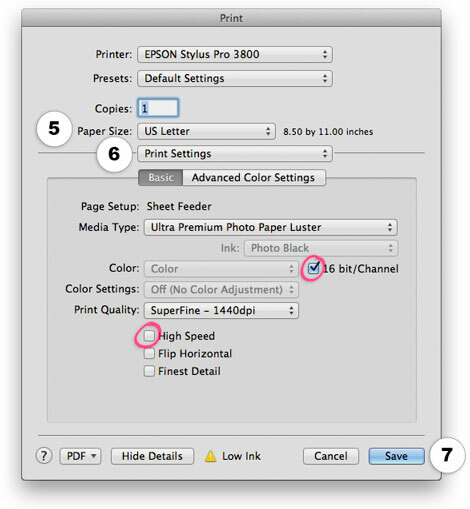 Printer Profile: choose the profile that matches the printer and paper you are using. Epson 3800 profiles are abbreviated, so you would select select Pro38 PLPP for Ultra Premium Photo Paper Luster (formerly “Premium Luster Photo Paper”). Here is a guide to 3800 printer profile acronyms. Check Send 16-bit Data if your image file is 16 bit. Rendering Intent: Perceptual or Relative Colorimetric (with Black Point Compensation checked) are best for photos. Adjust image size and position on paper, if needed/desired. Media Type: Choose the type of paper you are using. Check 16 bit/Channel if your image file is 16 bit. 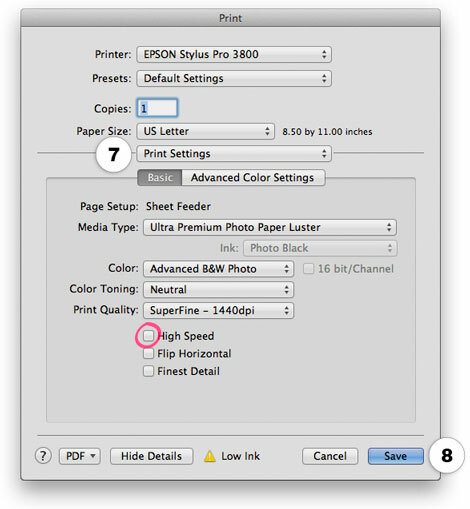 Uncheck High Speed for a better-quality print. Click Save to return to the Photoshop print dialog. Click Print in the Photoshop print dialog to begin printing your image. 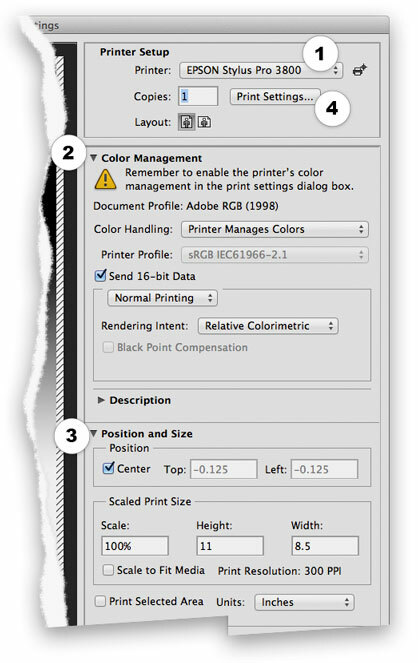 Color Handling: choose Printer Manages Colors. Rendering Intent: Perceptual or Relative Colorimetric are best for photos. 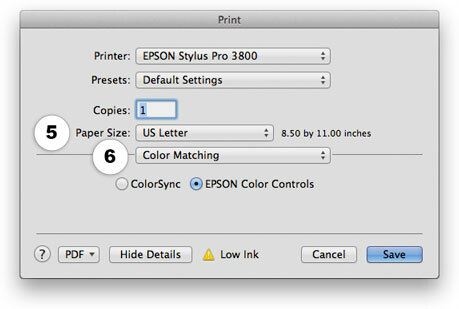 Choose Color Matching from the pop-up menu and select the radio button for EPSON Color Controls. Color (Print Mode for the 7900): select Advanced B&W Photo. While capable of producing many colors, monitors and printers are unable to recreate all the colors visible to the human eye. Printers lay down Cyan, Magenta, Yellow, and Key (black) pigments which absorb light to create (subtractive) colors. CMYK processes can only reproduce a relatively small gamut, or range of colors. By contrast, monitors emit combinations of Red, Green, and Blue light to create (additive) colors. RGB has a substantially larger gamut than CMYK. It encompases most, but not all, of the CMYK colors. Perceptual: The priority here is to maintain the relationship between the colors for a natural photographic look. The color values may shift to bring the whole image into the printer's gamut. Saturation: Here, creating an image with vivid colors is prioritized. The accuracy of the colors and their relationships may be sacrificed to reach this goal. This is generally not ideal for photographs, but works well for display graphics. Relative Colorimetric : The priority here is to produce a natural photographic look while staying as close to the original colors as possible. The computer image's white and the printer's white are aligned and the rest of the colors are shifted accordingly. If any out-of-gamut colors are left, they are shifted to the nearest in-gamut value. While this might distort some relationships, more of the original color values will be preserved than when using Perceptual. Absolute Colorimetric: This method prioritizes accurate color reproduction. All the colors that can be reproduced by the printer remain as-is, and the rest are shifted to the closest in-gamut value. This may result in more relationship distortion than Relative Colorimetric, but it will produce more accurate color values overall. Black Point Compensation: Your monitor and your printer will likely produce different color blacks, one being darker than the other. 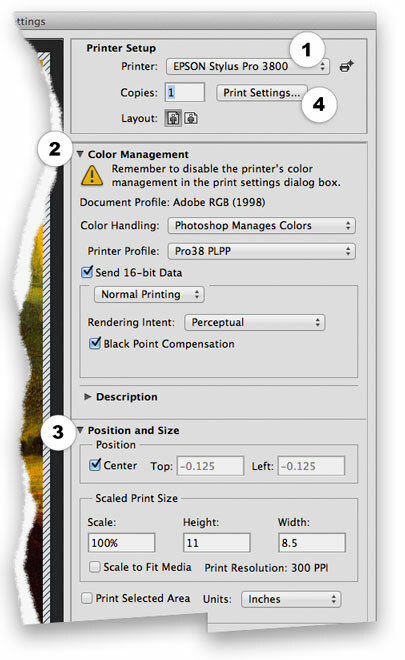 Choosing this option will take this difference into account when the colors are adapted to the printer's color space.